The light source from the left creates a triangular composition between the three main elements in the painting: the window, the map and the pitcher. This technique helps make the girl the central figure and focus of this piece. This composition also creates volume and depth in making the image as realistic as possible in three-dimensional viewing. Vermeer has taken realism painting to a new level. 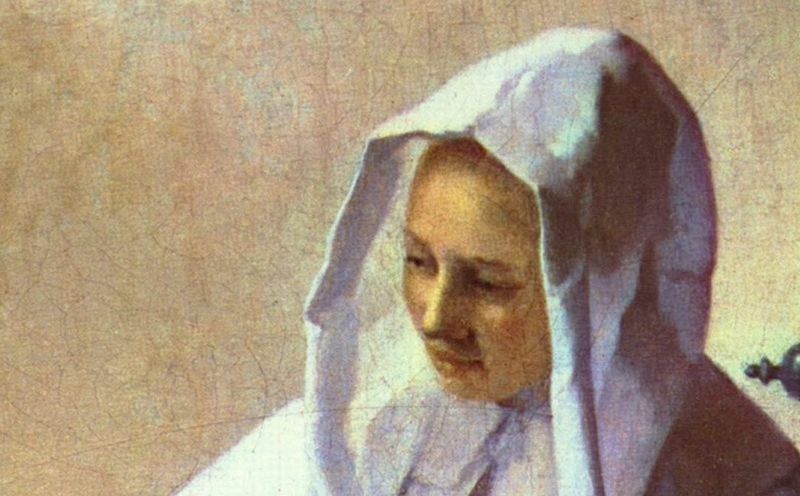 In this work we see, once again, Vermeer's abundant use of ultramarine. His unique use of ultramarine and black undertones creates a rich, dark midnight hue that can be clearly seen in the woman's dress, window and map rod. Using this technique in the dress created depth and volume and it also produced a sense of movement in the way the light finds its way into the folds. Vermeer uses pure blue tones to define the shadows, especially in his subject's headdress, the walls and even the gilded pitcher itself. This made the artist the first to implement this technique in his works as artists traditionally used black and grey hues for shadow It was not until the following century that other colors came into play. In Young Woman with a Water Pitcher Vermeer uses the black like an undertone to the blue to create shadow and depth, and in doing so he also depicts movement and texture. Vermeer uses the ultramarine for reflective surfaces such as the window and even the glass shadows are cast in blue to reflect the intricate play of light on its smooth surface. For the objects on the table, he excessively uses oranges, tonal browns and a red pigment known as red madder lake, which adds a rich ruby tone to his work. Vermeer also uses yellow ochres in rich layers for the pattern in the rug as well to accentuate its exotic and rare nature as the light moves softly through its velvety texture. This red can also be seen in the open jewelry box to show its velvet interior. 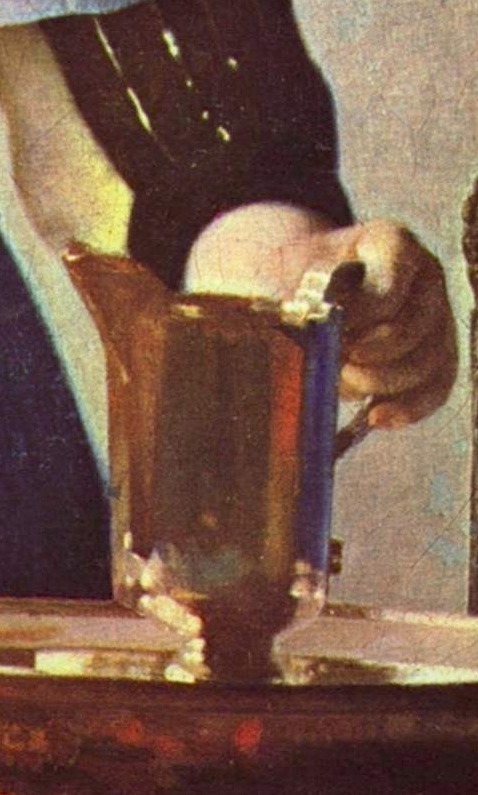 The water pitcher is proof of Vermeer's excellent skill in still-life painting techniques. Deep brown mattes and tin ochres were used as an undercoat to bring out its gleam. The strip of ultramarine on the right overrides the yellow ochres used for its golden appearance. 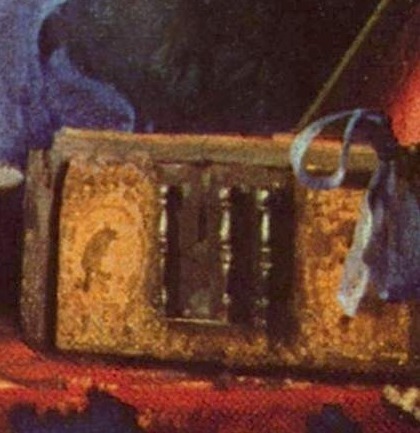 In this image Vermeer plays with aspects of optical illusion using his camera obscura. He plays not only with the light coming in from the window but also how it reflects as it fills the room on a horizontal plane and bounces off the pitcher. This can be seen in the immense detail of the pitcher's reflection on the woman's hand creating that golden tinge as her skin nears the object. The pitcher's lighting is definitely a product of the camera obscura, as it is highlighted in ways that could not be seen with the naked eye or created by natural light. The same can be applied to the jewelry. Delft was situated near a river as most of Netherland's cities were and so there was always a damp mist in the air. This technique was used to convey the brisk air entering the room after opening the window. Such a technique allowed the artist to depict the mood in the room. Furthermore, as the girl is seen looking into the distance, her exact thoughts are unknown, making the haze effect indefinite like her state of mind.